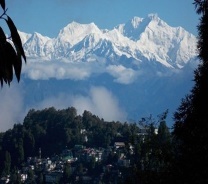 Spread in ribbons over a steep mountain ridge, surrounded by emerald-green tea plantations and towered over by majestic Khangchendzonga (8598m), Darjeeling is the definitive Indian hill station and is arguably West Bengal’s premier attraction. When you aren’t gazing open-mouthed at Khangchendzonga, you can explore colonial-era architecture, visit Buddhist monasteries, and spot snow leopards and red pandas at the nearby zoo. The adventurous can arrange a trek to Singalila Ridge or hire a mountain bike for a guided ride around the hilltops.